Avicii’s debut album True on PRMD/Island debuts at #5, highest soundscan debut ever for solo EDM artist! Wake Me UP single rises to #4 bullet on hot 100, with radio audience of 100 million and growing. Avicii brings acclaimed live show to Hollywood Bowl this November 9th. 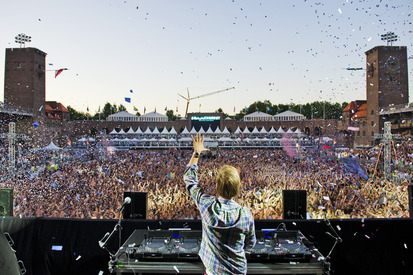 (Sept. 25, 2013 – New York, NY) – PRMD/Island Records superstar DJ/producer Avicii enters the Billboard 200 albums chart at #5-bullet with his debut album, TRUE, on first week sales of 50,000 copies. This marks the highest studio album debut in Soundscan history for a solo EDM artist. TRUE, which topped album charts in 70 countries, contains Avicii’s phenomenal single “Wake Me Up” (featuring Aloe Blacc), the #1 iTunes smash in 70-plus countries. “Wake Me Up” moves to #4-bullet on the Billboard Hot 100 in its 13th week out, dominating radio on multiple charts all summer, with an audience north of 100 million and rising.